Anti-twist device located in the area of the Microwave or other Focused Beam antennas to provide six-way guying. Bolts to tower at any section joint and attached with joint bolts. Must be installed as sections are joined together. The 25G tower can be used inguyed, self-supporting or bracketed configurations according to specifications in the ROHN catalog. As a guyed structure, it can rise to a maximum of 190 feet. Consult ROHN Catalog Links at Footer Section below for ROHN 25G Tower Details. 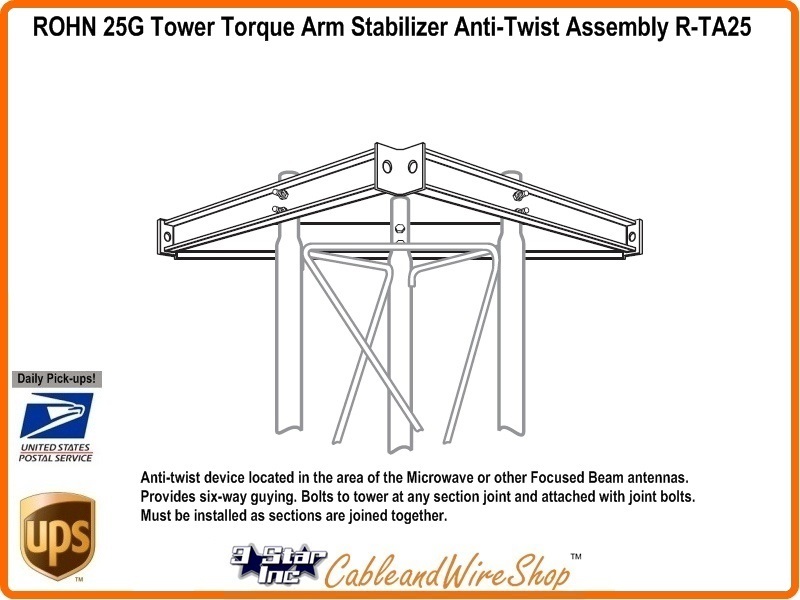 Note: Locate this Anti-twist device in the area of your Microwave Dish or Focused Beam Broadcast and Receive Antennas. Provides six-way guying, so be sure to account for the Total number of Guy wires appearing at each Tower Ground Anchor Location. Bolts to tower at any section joint, attached with joint bolts and must be installed as sections are joined together, so plan the Antenna Locations on the 25G Tower Before Assembly (Engineer the Wind Load accordingly). Install the Torque Arm Stabilizers as to not impede Installation or reception to other Antennas located on the same Tower or Adjacent Towers. Buy ROHN. Buy American.